Depending on who you are, animated movies can be a hit or miss. If you don’t already enjoy the genre, perhaps you think they’re movies solely for children. Shhhh. Thou doth protest too much. Or, in layman’s terms – you don’t know what you’re missing. Especially if you’ve ever passed up on watching any of Hayao Miyazaki’s animated films. He is basically the Steven Spielberg of of animated movies. Each movie is a masterpiece and there is something in them for adults and children alike. The movies are colorful, funny, heartwarming and the characters are complex and relatable. There usually is some sort of talking creature/ animal and the art is phenomenal. Even though the movies and the director himself are Japanese in origin – they attract a large number of American movie-watchers. They also always seem to get an incredible cast of voice actors for the English versions of the movie like Liam Neeson, Anna Paquin, Cate Blanchett, and Kirsten Dunst. If you thought animated movies were just for children – welcome to the big leagues. 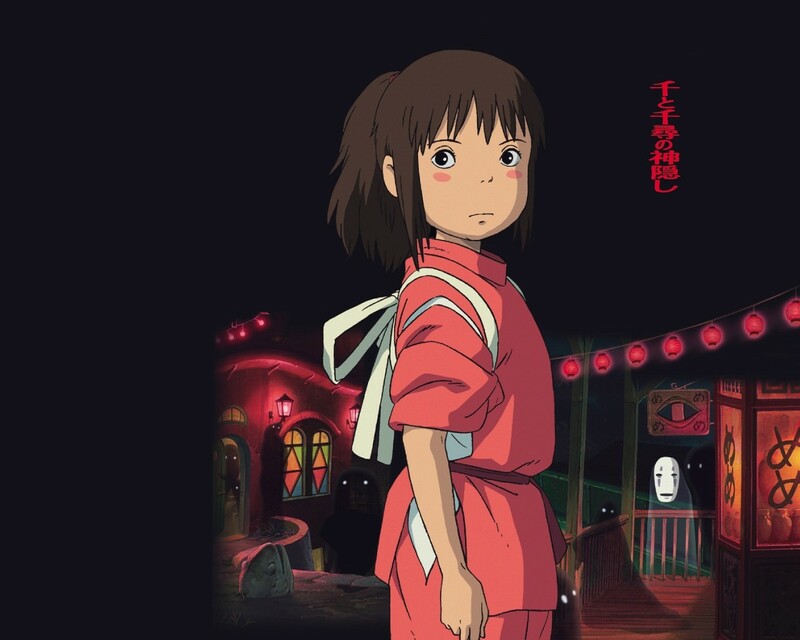 Spirited Away is an incredible movie about a girl who gets separated from her parents in a ghost town of sorts. She becomes trapped there and has incredible adventures. Things get a bit eerie pretty quickly at the beginning of the movie. When the main character, Chihiro, and her parents come across this ghost town they are unaware of it’s otherworldly properties. They venture further into the town because they are hungry and smell food cooking. 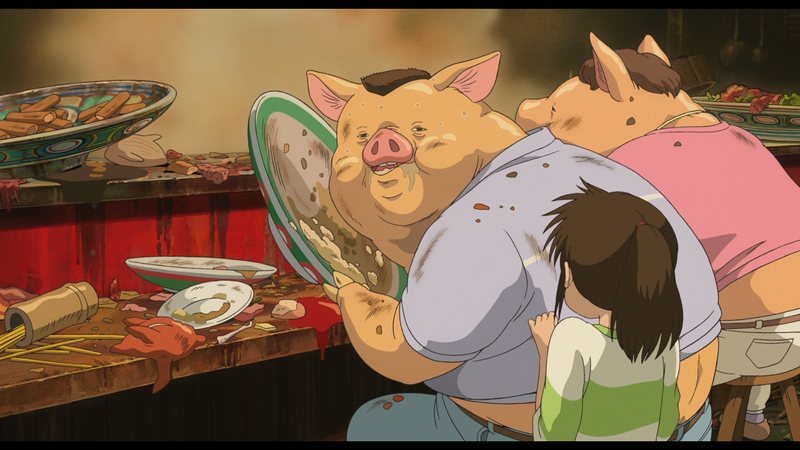 Chihiro’s parents eventually find a stall with steam billowing and dishes filled with food. They sit down and begin to help themselves, telling Chihiro to sit down with them to eat. 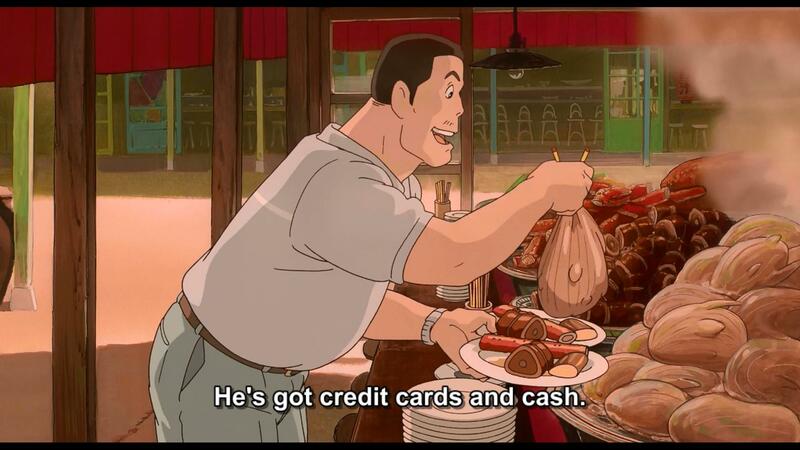 Her father is especially hilarious because he assures her that she is fine to begin helping herself because he has credit cards to pay for whatever damage they do to the food. Chihiro is obviously unnerved by the sudden appearance of a food stall in a town that is seemingly empty. She refuses to sit down with her parents and also begs them to stop eating. Things begin to get weird and Chihiro notices that as her parents are ravaging the food (and increasing their rate of guzzling by the second). They grab portions of unnamed food greedily and barely take time to chew as they shovel it all into their mouths. In a moment of dreadful realization, Chihiro sees that her parents are expanding – like Violet Beauregarde in Willy Wonka and the Chocolate Factory – but to her horror, they are not turning into human blueberries but morphing into pigs! A.) That food looked amazing – whatever the heck it’s supposed to be. B.) I love Asian food. All Asian food. Please feed me Asian food. C.) It makes you question – if you knew you were going to turn into a pig after gorging, would you still eat the food? Well…maybe you wouldn’t but I certainly felt conflicted on the matter. 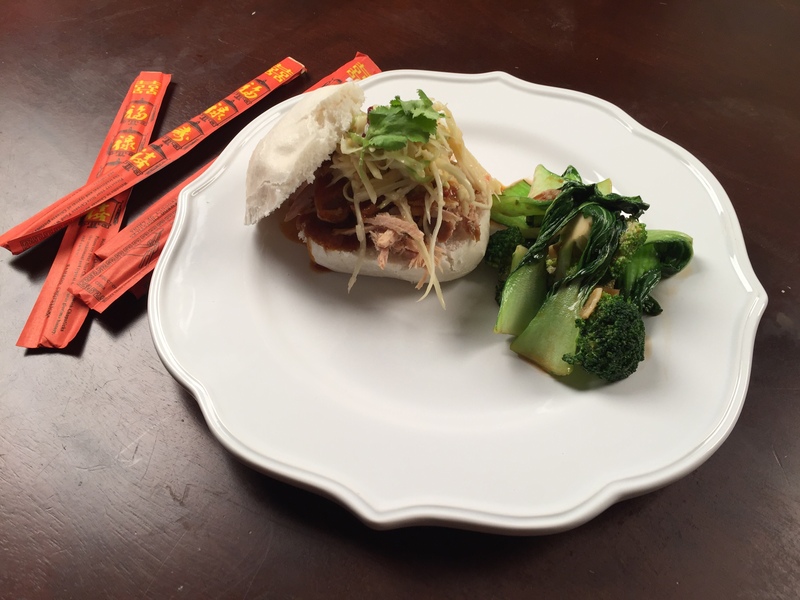 *To build the sandwich, I used Asian Bao buns. I microwaved them for a minute with a wet paper towel over them before I cut them in half and filled them. These buns are usually found in the refrigerated/freezer section of your Asian grocery store. If you can’t find these easily – you can use Hawaiian sweet rolls. They come in slider sizes that would be great with this dish. The morning before your dinner, set up your slow-cooker to cook at the low setting for 6 hours. Throw your meat and all of your ingredients for your sauce in the cooker. An hour or so before you’re ready to eat, make your slaw. Mix all of the ingredients with the cabbage and the carrots together and set in the fridge while you’re prepping your pork. This will give the slaw a chance to absorb all the flavors of the dressing. While the slaw is making magic in your fridge, I like to make a gravy for the pork. 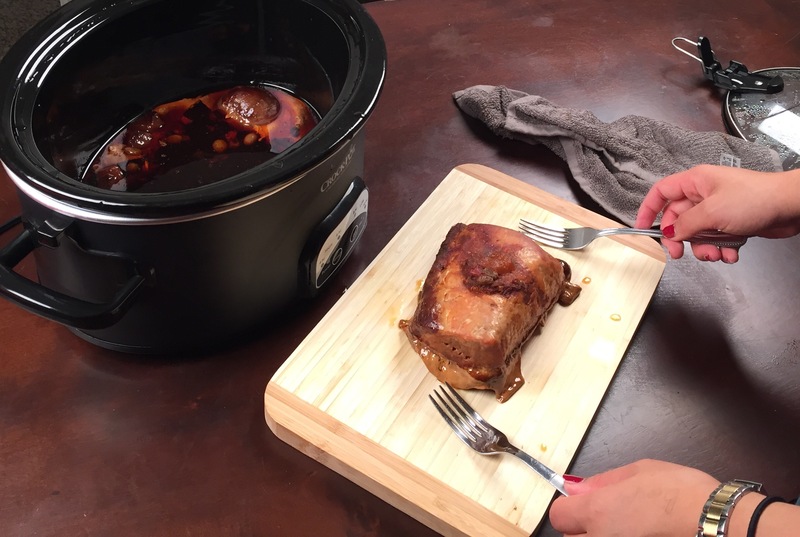 Take the pork roast out of the slow cooker and set it on a plate and set it aside. Pour the remaining juices of of the pork into a large sauce pan and bring the liquid to a boil. Once it comes to a boil, turn the heat down to let the liquid simmer for about 3-4 minutes to reduce a bit. While your sauce is simmering, make a slurry of 1/4 cup of cold water and two tablespoons of cornstarch. Mix together and pour into the simmering sauce. Stir the sauce and let it cook until the mixture begins to thicken. 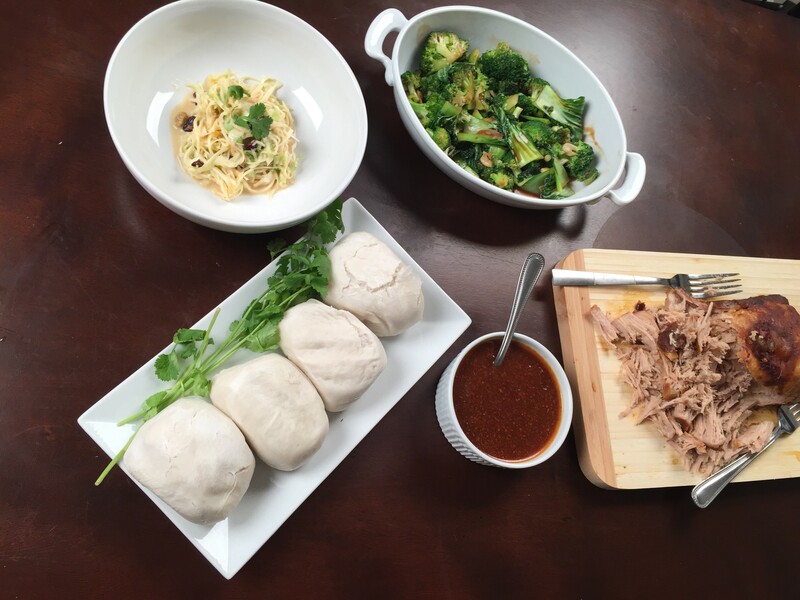 Once the sauce has thickened – you’re ready to slather some pork with it! Shred your pork with ravenous savagery. Build your sandwiches with your bread and and pork. Top with your sauce and heap piles of cold, refreshing slaw on top and devour sixteen sandwiches. Don’t bother restraining yourself on this one. You wont turn into a pig, I promise. < Previous Wednesday Wanderings – Are you awkward? I’m awkward. I try not to be.